Exciting Youth Group Games for indoors and outdoors. Find Games for Teens at Church, Sunday School, and Camp! No matter who you are or what you are doing, if you're in ministry with Teens, you're going to need some Games! These Youth Games are all field-tested (probably in a field) and lots of fun! Many thanks to my son, David Chatwell, for helping write up and organize these games. David is trained as a Youth Pastor and is great at working with teens. He assures me that these games are some of his favorites! And be sure to scroll down and read "How to Make Games More FUN!" A fast-paced game where everyone makes up and passes their own sign... One of the best parts is making up the signs! Each group tries to be the first to get four of their teammates seated on a "couch" ...whether or not there is an actual couch is entirely up to you! Kids in a knot try to untangle themselves without dropping hands... Sort of like "Reverse Twister"
A wacky game of tattling and rules that is incredibly fun to play. (If you're a mom, like me, just take my word for it and stay out of the room when they play this one.) Great for overnights or long rainy afternoons at camp. Possibly the world's greatest outside game, with two large teams trying to find and capture the other team's "flag"
A ridiculously fun outdoor game where Secret Service agents protect their Presidents "at all costs" ...Try to live through it! A running game where evenly-matched competitors try to retrieve a common object... Add "extra bacon" for fun! A fun game like Dodge Ball with two large teams and some great adaptations... "Call the Doctor... I've been hit!" A wonderful game of winking and tackling ...Play this one outside for sure! A pushing and pulling game where you try NOT to touch the trash can... Don't fall in! Similar to Ultimate Frisbee, but with different objects. "Ultimate Banana," anyone? Youth Group Games? I recommend these notes by Dr. Les Christie! Explain the game quickly and clearly. Make sure you have played the game or have seen it played. Demonstrate the game if possible. Explain the game with excitement or enthusiasm. Put students in the game playing position before playing the game. Get referees that are fun. If at all possible, have kids lead the game. Include the physically challenged kids. Stop a game at its peak. Kids remember the last ten seconds of a game. Find Lots of GREAT GAMES PLUS... Advice on Playing Any Game! 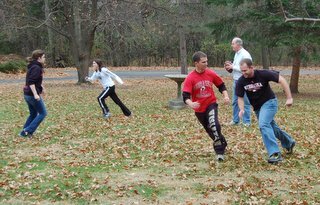 “Best-Ever Games for Youth Ministry"
Dr. Les Christie is the Chair of the Youth Ministry Department at Jessup University. He has written many books on youth ministry, and is a recognized expert on games. Youth Specialties is a Christian organization that helps youth workers all over the world via their annual conventions and the Internet. If you work with Youth, check out their website for wonderful resources and help! I hope you enjoy these Youth Group Games. They are the best ones we know about right now. We will be sure to add more as we discover them. Again, I'd like to thank my son, David, for helping collect and organize these games. David is currently in ministry with youth and uses these games with them all the time. They are, after all, some of his favorites. Have Fun! And... Let the games begin!